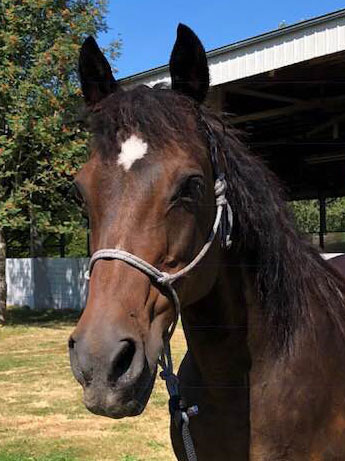 Star belonged to a gentleman who surrendered him to SAFE after he was injured by his horse and could no longer care for him. The accident happened in the crossties when Star spooked and accidentally knocked his owner down. We don’t feel that Star is inherently dangerous, but like many horses, he is spooky and can act in unpredictable ways when frightened. We are working with him to help him gain confidence and hopefully become safer in stressful situations. He’s a nice fellow but needs leadership. 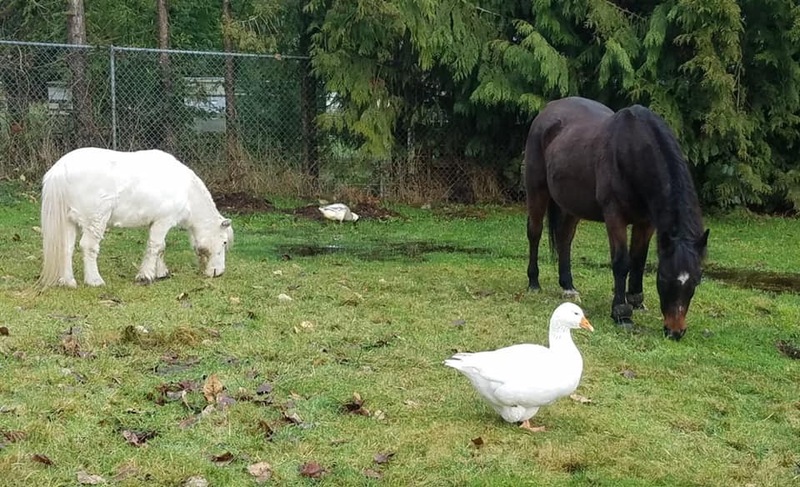 Star found his adopted home in December 2018 with Tammy’s family and their miniature horse Elliot and two unlikely herd mates: a goose and a duck! Before leaving SAFE, Star had adapted well to a new environment with consistency and fairness from his human handlers. 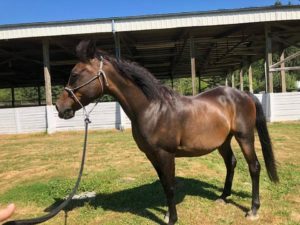 We suspect Star may be a late cut stallion, and though healthy, his age and an old injury in his left hindquarter–which involves scar tissue and is not painful–made him a companion candidate rather than a riding mount. Star had a huge transformation at SAFE and this gentleman now has a wonderful family to call his own! We are excited to share that Star has been adopted by Tammy and family. Their pets include a miniature rescue horse named Elliot and two unlikely herd mates: a goose and a duck! Before leaving SAFE, Star had adapted well to a new environment with consistency and fairness from his human handlers. 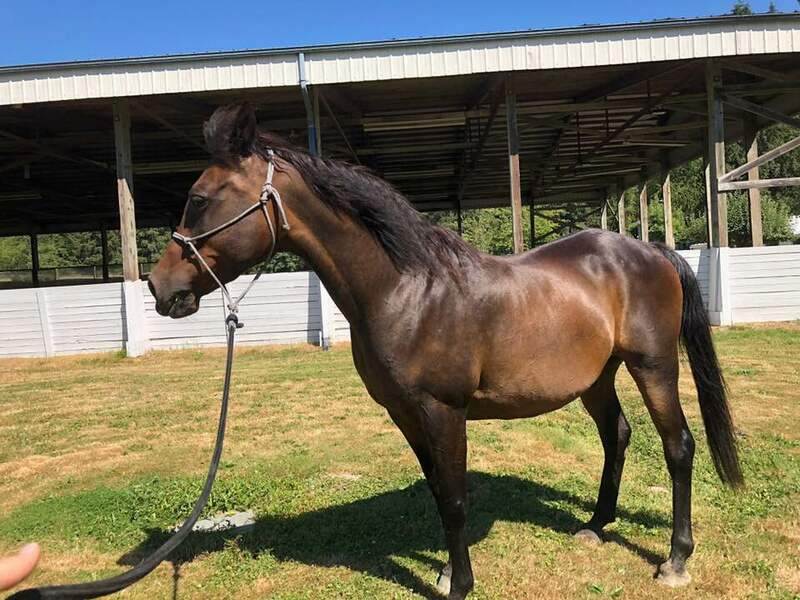 We suspect Star may be a late cut stallion, and though healthy, his age and an old injury in his left hindquarter–which involves scar tissue and is not painful–made him a companion candidate rather than a riding mount. Star had a huge transformation at SAFE from a reactive and pushy guy to a gentleman who respected boundaries and was kind and relaxed. He deserves a nice retirement and now has a wonderful family to call his own! I had another great clinic experience with Star and felt like he made some great improvements between clinics. 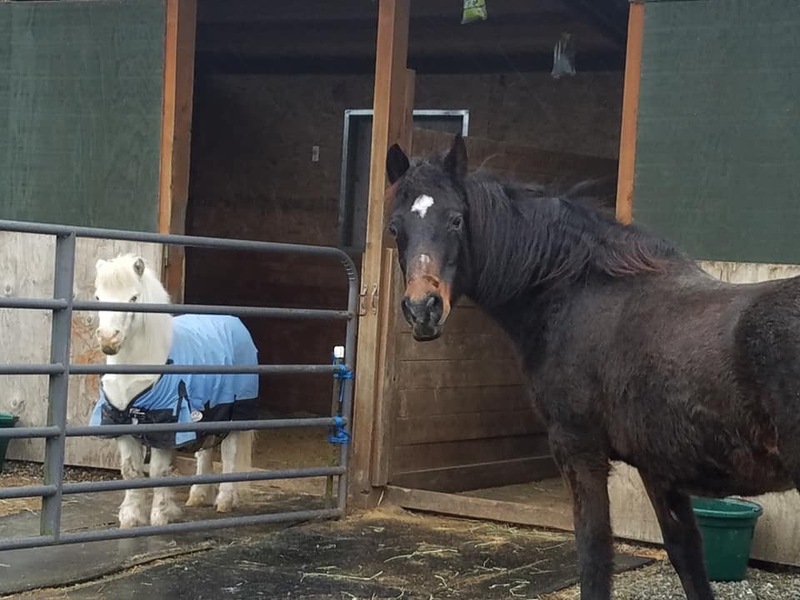 Star has become very responsive when tied and has learned how to yield his hindquarters easily so that he can be brushed on each side and have his feet picked. When he is alone, he is easier and I noticed that with all the horses around, he got a little excited so didn’t focus completely on me when cleaning his feet. When the clinic started each morning, Star was a bit unfocused but quickly focused on me and became calm and peaceful each day. Joel worked with me on knowing when to firm up and how much. I need to offer my good deal and then firm up sooner with Star so that I get a change from him quicker. Then offering a good deal and seeing him respond to what I am asking. I felt Saturday was the best day Star and I have ever had. I really felt a connection with him and that he was really willing to do whatever I asked. He tried hard and I could see a really good change in him. Star needs someone who can spend time with him and be a strong leader to him. He will follow, but he will also walk all over people if allowed. He is learning to be respectful but must be reminded all the time. When working with him one must never lose focus. I know if feels me and feels my presence and pressure. Sometimes he doesn’t always like being asked to do something, but he always does it. He is learning that he is not in charge all the time anymore. Our new guy Star is settling in well to the day‐to‐day routine at Safe Harbor. We have not pushed him too hard, given his age, but we have assessed him for soundness and temperament. For the most part, he is easy to handle and can be safely lead and groomed, bur he does tend to be on the “pushy” side. His behavior makes us think he may have been a late cut stallion, which explains some of his attitude towards people. Consistency and fairness are making a world of difference for Star, and we have already seen a lot of very good changes. It can be a little upsetting working with horses like Star…because this could be the first time in his entire life that he’s been asked to behave a certain way. You have the best intentions, trying to give the horse some boundaries that will keep everyone safe, but it takes discipline and you end up feeling like a big meanie. We take in plenty of horses who have gotten away with walking all over people. They’re not “bad” horses; they just don’t know any better. Since Star didn’t feel he could trust people to keep him safe, he resorted to taking things into his own hands. This results in the pushiness and overreaction we have seen and in Star’s case, might have resulted in his previous owner being knocked down and injured. The good news is that with horsemanship work, we can show him an easier way. 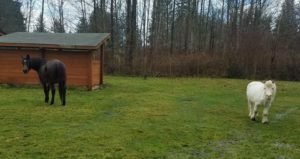 By always offering him a “good deal” first, we have the opportunity to support better behavior and experiences with humans that leave him feeling successful and peaceful from the interactions, instead of alone, afraid, or reactive. On top of the extensive training needed to help him become a quiet riding mount, Star has fibrotic myopathy in his hind left leg. This is a mechanical lameness of the hind limb. The gait change is caused by a mechanical limitation on movement of the hind limb. Luckily this is scar tissue is not painful but the irregularity of the gait can cause other aspects of the body to be strained from compensation of the irregular movement in the hind. Star’s injury is in the hamstring muscles in the upper hindquarter. This causes him to slap his left hind down when he walks or trots. 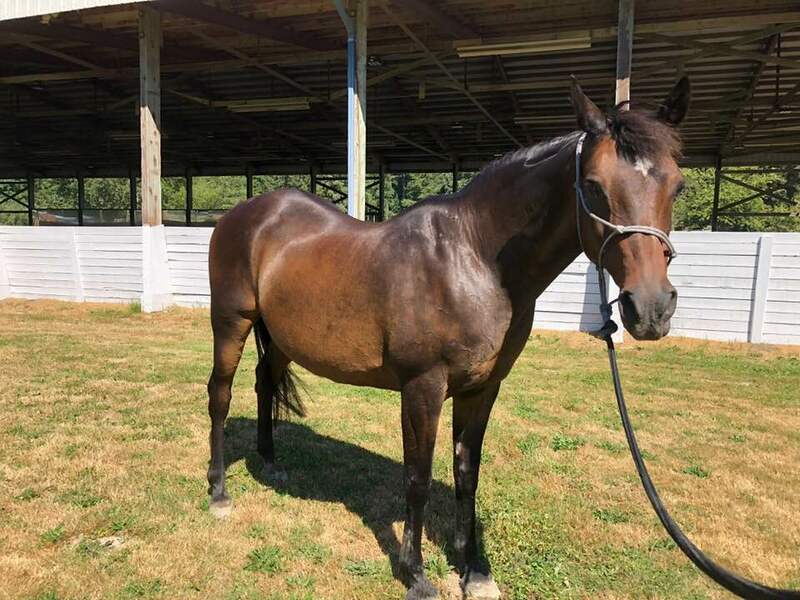 There is surgery that can be done to remove the scar tissue but since the lameness is not painful, this is not something SAFE would want to put this older gelding through. So where do we go from here? We are faced with a sensitive, 22 year old Arabian who needs a lot of good horsemanship work to help him make better decisions. We will continue to help give Star the tools he needs to be a gentle horse. 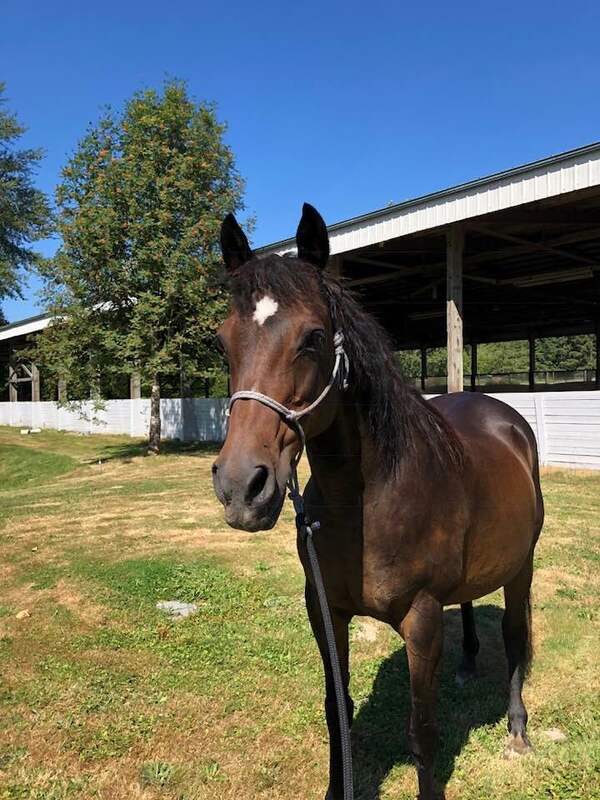 Right now, he is working with one of our Horsemanship volunteers to tune up his ground manners, lightly exercise him, and give him love and attention while he is at Safe Harbor. Already we have seen great improvement in his responsiveness and relaxation. We will also assess his interactions with other horses to see how he is for group turnout and what personality type he is within the herd dynamic. This will help us better place him in a home where he can be loved and cared for as a companion. He is currently available for adoption. His new home will need to have skills dealing with sensitive horses. Overall, Star is a good boy and when handled correctly, is no trouble. He would not be suitable for an elderly owner or child without adult supervision. An experienced horse person won’t have trouble with him and, to the right home, he will make a great addition to someone’s family. Star began his training today at SAFE. He definitely has some training in there, some typical late cut Arabian attitude, jumpy but comes back quickly, a sweet cuddly side and a “walk all over you with my left shoulder” issue. He was a very good boy for his first session. We’ll see changes but due to his age and past handling it’s going to take some time and patience. We were able to give him a deep cleaning bath today and overall he was a gentleman…he’s just not a fan of standing around. He is in no muscular shape to try and ride at this time. We’ll reassess as he progresses through the training program. Click here to sponsor Star! Every horse deserves at least ten friends! Even a small monthly donation can make a difference. Plus, SAFE horse sponsors receive discounts at local businesses through the SAFEkeepers program!